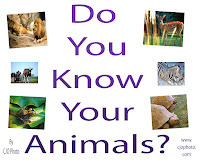 CJO Photo: Free Printable eBook: Do You Know Your Animals? Free Printable eBook: Do You Know Your Animals? Video: Do You Know Your Animals?